Please wear protective equipment, such as a safety helmet and safety goggles, at any cost at the time of construction. It can be used almost as if it was purchased with 1800 yen for one piece of hardware or something, but the price is also cheap and satisfied. This review is about item#08353886. Finishing and deburring after welding etc. I bought it for trial because the unit price per piece was cheap. 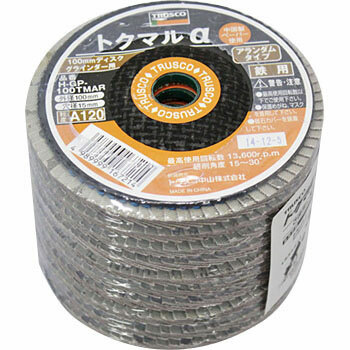 Recently I was using a monotaro brand "Abrasive cloth disk · alumina" yellow-colored guy, I thought it was okay but it is harder to bake this trussco compared to it, feeling that autogenous action is faster It was. Other than that I did not feel any difference. Because the unit price is about 110 yen per piece, I will try using this for a while. This review is about item#08353895.